Hiring a voice over online, who has a studio, is easy! It’s far simpler, quicker and cheaper than if you hired one through an agent. A voiceover agent is just the middleman who adds a fee on top, bumping up the cost. If you hire through an agent, you’re also likely to have to hire a recording studio – again, more expense. Better to go direct to the voice over talent. Neil is a British male voice over artist who’s been recruited by companies and individuals around the world to provide an English voice over for a vast range of projects – all hired online. He offers a professional voiceover service – voicing, recording and editing from his studio based in London, England. 1) Make contact with Neil to discuss the project and quotes. 3) Receive your audio, in your choice of format, ready to be used. 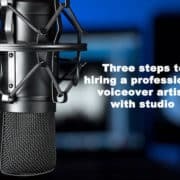 If you need to hire a voice over artist with studio, you can get started right now! In most cases you’ll receive the audio back within 24 hours. There is also no extra charge for minor script changes or re-takes.